With the Kazimier team set to launch their grand vision for the Invisible Wind Factory, Getintothis’ Adam Lowerson spoke to Sam Crombie about Liverpool’s changing cultural landscape. The Kazimier team have announced plans to reveal their ‘Grand Vision‘ for their North Dockland venue the Invisible Wind Factory at a gala dinner and fundraiser on April 21. The team will unveil their plans to transform the Invisible Wind Factory into an “indoor utopian village for culture“, as well as announcing a huge summer project and launching a month long crowd funding campaign to support the plans. Readers of Getintothis will have the chance to win a pair of tickets to the event, with details of the competition found at the bottom of this post. The evening will consist of a three course banquet, a live auction of Kazimier memorabilia, a line up of bands and DJs, behind the scenes ‘Factory Tours’, as well as live updates of the funding raised on the night. Speaking on the vision for the Invisible Wind Factory, Kazimier Productions‘ music director Sam Crombie told us, “IWF is a project for the long-term that will take time to complete. It encapsulates our dreams and artistic desires. But it is also grounded in the aim to serve the wider creative community – the people who visit, collaborate and participate. The Gala dinner will be our chance to present the vision – why it is worthy of support and how it could benefit the city. While specific details regarding what the grand vision entails are being saved for the big reveal at the gala dinner on April 21, it’s clear that Kazimier Productions are keen for the Invisible Wind Factory to be seen as more than just a music venue. Live music will still play a huge part in its future, but the Invisible Wind Factory has ambitions to encompass far more – becoming the epicentre for creativity in all forms on Merseyside. 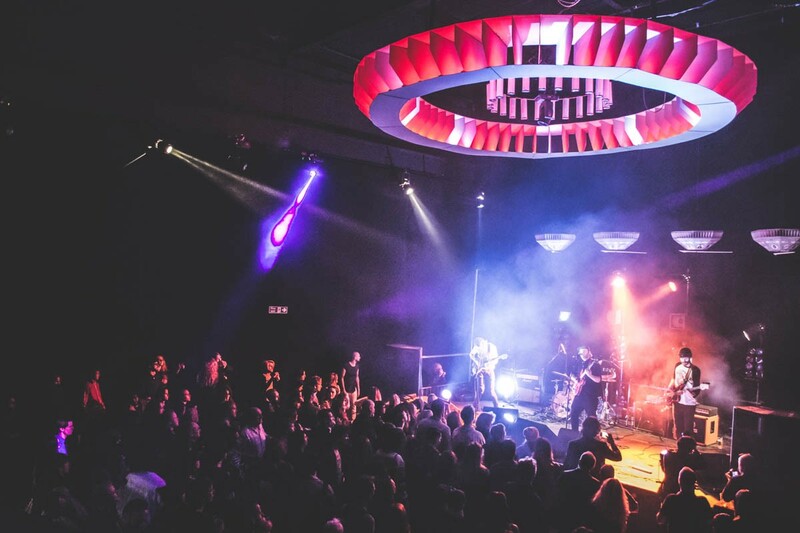 “We want to provide a unique setting for touring bands to play – The Kazimier was a great example of the old school sweaty, low ceiling gig venue. The Invisible Wind Factory can feel expansive, intimate, immersive – whatever is required and we want to work with touring acts, promoters and producers to create an environment that is right for the nature of their show. A huge talking point on Merseyside this year has been the announcement of Ten Streets, the council’s plans to turn a huge part of the North docks into a ‘Creativity Zone‘ for the city. Kazimier Productions have been and continue to be involved in discussions regarding the development, and while the team have been negatively effected by developers in the past with the closure of the Kazimier, they feel the investment will help the area. Crombie said, “It’s a double-edged sword. We came here to escape the developers, and the Ten Streets marketing obviously encourages and attracts developers and their investment. However the success of our project relies on people wanting to come to this area. “We’ve already got the beginnings of a strong creative community in the area which is quickly growing but we can’t improve the transport links, quality of the roads, street lighting, etc ourselves – we need the investment the strategic plan Ten Streets will bring. “The Ten Streets development at this stage is a big marketing exercise – however there is substance in these terms and the plans already put forward. The Council have learnt from the process of the Baltic Triangle’s development, there is an understanding that without ‘Zoning’ the planning department have no guidelines as to what should or shouldn’t be developed within the area. Ten Streets and the emergence of the Invisible Wind Factory are the latest major milestones in Liverpool’s ever changing cultural landscape. A creative scene which has experienced turmoil in recent years, with favourite venues such as the aforementioned Kazimier and Mello Mello closing down, and the concerns over the future of 24 Kitchen Street. Although the underground feel of the scene might not be the same as when the Kazimier first opened, Sam Crombie feels that the creative scene in the city is as busy and vibrant as it has ever been. He said, “When we opened The Kazimier, there were pockets of underground creative scenes – the Kif on Parr street, International gallery on Slater Street, Mello Mello, Casa De Brujas on Duke Street, all very DIY and raw unlicensed spaces in the centre of town for art, music, exhibitions. “They weren’t thinking about their Instagram followers. As the city centre developed these spaces/scenes were swallowed up by cocktail bars and mega-burger joints. Fast forward and we’ve still got venues and space for creative happenings, it’s just now these are much better run licensed premises – the ‘edge’ might have gone but I think there are more people than ever involved. So while the finer details of what the future holds for the Invisible Wind Factory and how it will fit in with the Ten Streets development are still being well guarded, there’s certainly a lot to get excited about. The ambition and vision shown by Kazimier Productions hint at the potential for something the city can be proud of, and that will rival creative spaces and attractions across the world. Ten Streets might just be a marketing exercise, but the Invisible Wind Factory means business. To win a pair of tickets to the gala dinner like the Getintothis Facebook page, share this post and tag a friend. Good luck. Full details of the Kazimier Productions/Invisible Wind Factory’s Grand Vision will be revealed at their Gala Dinner and fundraiser on April 21.